Cartoon by Juan Ramon Mora showing the wheels coming off mainstream Spanish political parties, the left-wing Socialist Worker’s Party (PSOE), and right-wing Popular Party (PP), whilst Podemos accelerates. David Mountain: Podemos is the result of demonstrations and square occupations that began on the 15th May, 2011. The party hopes to represent the people of Spain in a way that older leftist parties and organizations failed to do. How does it intend to succeed where others have failed? What precisely is new about Podemos? What follows the name of the party "we can"? What new can we achieve? Eduardo Maura: It is true that Podemos would be impossible to understand without the demos—the movements, the people in the squares and on streets. But Podemos should not be equated with those movements. A lot has changed in Spain since 2011, not least of which is the common sense that underlies politics today. What happened in 2011 has to do with the downfall of the two-party political system. The people have lost confidence in that system, and that confidence is not going to come back. This opens a new political space which is not on the left side of the political field, but at the heart of it. So, it is a question of a change of generational, social, and political frame. What snapped in 2011 was not the power structure itself, but nevertheless something changed. This is what we build upon. The language of “Left and right” in Spain has become so discredited that you cannot possibly build upon it. The people’s demands are no longer captured by such categories. Democracy in Spain is built upon a consensus as to what is and is not relevant and both the establishment parties of the Left and right, including parties to the left of the Spanish Socialist Workers’ Party (PSOE), cannot actually register the demands of the people. So, confidence in the system is shattered. It has taken us four years to realize that we needed a different approach if we are to represent the people’s demands. So what’s new to do? It isn’t what we say, but what we do—how we organized, how transparent we were, our independence from the banks, our openness to popular participation, etc. This all allows people to feel part of a process that is greater than simply building a party, but amounts to building new prospects for change. That is something new in European politics. It’s how we got to where we are now. Lucy Parker: At the event last night with representatives of Left Unity and Syriza, you mentioned the idea of “common sense.” Also, I recently read a short article by one of your members, Íñigo Errejón. He too wrote of populism and common sense, as derived from the theories of Ernesto Laclau and Chantal Mouffe.1 Could you explain a bit more about that? How does this idea of “common sense” speak to the present? Is Podemos a party of “common sense”? If so, what does that mean? EM: “Common sense” as we intend it is not a natural thing. It has to do with society’s operation as a symbolic space in which metaphors come to rule aspects of everyday life. “Work,” for example, is an empty word and can mean self-contradictory things. In this symbolic space parties and movements are able to build new meanings. What we do (which may have to do with Laclau and Mouffe) is to build a chain of equivalence between political demands and the actual feelings of the people—for instance, “transparency,” “sovereignty,” “popular unity,” and “citizenship.” Those things do not necessarily relate to each other—it’s a chain we have to build. Anger with the government can, of course, lead to, anti-politics, racism, etc. But this is not natural either. The idea was to relate these issues and problems to a simple idea: the lack of democracy. Podemos is not simply a response to a crisis that’s going to last 5 years, and then we’ll be gone. Of course, there is a huge economic crisis, but there’s also a huge institutional and political crisis. Referring to the Spanish transition to democracy, we call the system currently in crisis “the regime of ’78.” This does not mean that there was no transition to democracy, or that everything was wrongly done. There were wonderful things. It means that many of the ‘78 institutions no longer identify and meet people’s needs. But to build a new common sense, it is the people’s needs that really matter, not the banks’ or Brussels’. In a country like Spain there is a lot of anger with huge social issues on the table. We try to connect these very different demands. It’s a plurality of demands that you put together to build a chain of equivalence between the particular and the universal: “I need housing, you need a job: we need democracy!” People’s needs are, of course, highly varied, but Podemos tries to bring them together to build a common-sense that addresses not just the economic crisis but the systemic lack of democracy. Democracy has to do with people’s rights, which people are losing (the right to education, to a healthy life, etc.). Democracy is indistinguishable from the question of rights. What Spain lacks is democracy, which is being kidnapped by interconnected powers such as bad decision-making in Europe. DM: With respect to democracy, are we speaking of contemporary parliamentary democratic practice, or something else? You wrote in the Guardian, “Political parties and movements are tools, not ends in themselves.”2Is democracy a means or an end in itself? EM: Doing new politics means not addressing people in a finalistic way, e.g. “This is the goal: socialism, or a society not ruled by classes.” It’s not like that. Identities are not shaped that way anymore. Forty years ago it was possible to build this kind of identity: “You are born in a working-class environment, you are raised working class, you are a teenager who is going to be a worker, you spend forty years in more or less the same place working for more or less the same entity, therefore, you are a member of the organized working class.” This kind of subject formation does not happen anymore. The way capitalism has developed has fragmented so much, even fragmenting the way that identities are shaped. We still go to work (we can even spend 40 years working 12 hours a day), but that doesn’t make us working class anymore. If we organize ourselves, we don’t necessarily do so as “working class” anymore. This gets to the question, “Is Democracy a means, or an end in itself?” Democracy, too, can be an empty word. Nobody knows what “democratic economics” is. You can be a “liberal” or a “socialist,” but what does “democrat” mean when it comes to economics? Nothing. Democracy is not an end in itself because there is no precise positivity to it. It’s always a work in progress: meeting people’s needs in a context where needs keep changing, making people feel part of a society that’s worthy of the name, instead of just a bunch of isolated individuals scattered across different world cities. Parties that support democracy and seek to open up democratic processes cannot think of themselves as ends in themselves. That would be like doing politics like you do business—working for profit, being there to make money; means to a specific end, but at the same time an end in itself. Business does not go beyond money, but democracy goes beyond rights. Rights change. People demand different rights. Democracy can only be understood as an ongoing, open-ended process. You have to build it every day. It is not about voting every five years. If it doesn’t happen every day—e.g., no democracy in the workplace or inside the family due to gender trouble—then there is no democracy. So, it is not possible to say, “Yes, this is democracy. We’ve finally arrived!” It is always ahead of you. LP: Thinking back to the history of the Left and Marxism and the place of democracy within a Marxist understanding, for Marx democracy was bound up with Bonapartism: In some ways when people are faced with radical change, they fear it, and instead to look to democratic decisions within the state, to gain limited freedoms and protection. Whilst democratic demands are necessary, they are insufficient. Socialism in previous centuries attempted to overcome all existing forms of politics, even democracy. Today there has become this distinction between democratic and socialist projects. Would you separate a democratic from a socialist project and why? EM: Well we all know that Marxism has traditionally regarded democracies as they arose in the aftermath of the French Revolution as essentially bourgeois and fake. Democracy was a state-centered political space in which the violence of the state was going to be used against the people. We know that story (this is Eduardo talking here and not necessarily Podemos): I think that is false, a mistake. The French Revolution did not achieve what it aimed for, that is true. It started as a massive process of wealth and land redistribution in France and ended up with Napoleon. That’s true. But that does not mean that the French Revolution was just “bourgeois.” The idea of the rule of law, for instance, is truly democratic. Some would say that the democracy the French were trying to build was incompatible with capitalism. Of course, we’re talking about the late 18th century when capitalism was less developed. At the same time, I do not think it helps to regard the French Revolution and the whole tradition of liberal democracy as something “bourgeois”. Let’s face something: But this is not something particularly nice to say. LP: That points to the problematic tradition of the Left in the 20th century. Undoubtedly, the French Revolution as a radical bourgeois revolution gave rise to important demands such as universal suffrage, demands that pointed beyond society as it existed. Yet under capitalism, there is a need to push beyond them. EM: Again, if Marxism regarded the French Revolution as radical bourgeois, it was because there was a different model as to how politics should be done, and a different subject of change which Marxism was pointing towards. Marxism was able to build an idea of capitalism as actually leading somewhere else, as having a direction, however unspecific a post-capitalist society remained. But this traditional Marxist view misses the point. I don’t think that what was going on at the beginning of the French Revolution was as radical as that. But, as for Robespierre and the Committee of Public Safety, what was going on there was as radical, had as much to do with emancipation as that which the Marxist tradition has said. I am not saying Marxist tradition is completely wrong, but we have to understand that the Marxist idea of society and politics dismissed democracy more than it deserved. The idea of the state as an apparatus of violence had to do with a very important historical experience. But we have learned that the state can also work differently. Right now, I would embrace this nuance. Even the Paris Commune had to do with the state, even though they wanted to overcome it. Without the state they would not have been able to resist, even for a month. Democracy is a good name for the things that we do today. It is also a good name for what Marxists wanted to achieve. They should not have surrendered this word to the enemy. Democracy sums up a lot of things that traditional Marxism aimed for and it is a pity that we lost the symbolic space of democracy and freedom. Those things were not actually bourgeois. They are the greatest achievements of the 20th century. Universal suffrage was regarded as bourgeois, and you are not going to overcome capitalism by voting—everybody knows that. But in the late 1920s when the UK adopted universal suffrage for both women and men, that cannot be regarded as merely bourgeois. That was an achievement of the working class, of the trade unions, certainly, but of the left-wing Marxists as well. Why should we call that bourgeois? Perhaps it did not change the world, but it is a victory, an absolute victory. The French Revolution achieved a lot of things like that, and the same applies to many other political movements in the 20th century: They weren’t as radical as some Marxists thought that they should be, but they are the best we have. LP: On that point, how do we salvage these past attempts to transform the world? You have said today that Podemos seeks to move beyond the language of Left and right. This distinction, you maintain, is no longer relevant, no longer part of the “common sense.” But how do you salvage those past attempts of the Left? How might we learn from them today? EM: Well, much of what Podemos stands for comes from the Left. We talk about workplace democracy, rights, putting sectors under public control that have to do with people’s basic needs, and all these come from the tradition of the Left. But, the words that used to mean those things, like “socialism,” the “Left,” and even “communism”—the whole European tradition of making the rule of law and communism compatible, part of the same political project—none of that is now meant by these metaphors of Right and Left. Why should we cling to the signifiers, while failing to advance policies and solutions to concrete specific demands? Some say, “It is better to keep our identity intact. These words are important. They mean a lot to me.” Ok, but don’t do politics for yourself. Don’t do politics in order to safeguard your identity. Granted, the words matter. But we are addressing the same issues using different words. It is not Left versus right anymore. It is new versus old, or us versus them. These may not be the same as Left versus right, but many common meanings are there. And we just don’t need to feel part of the tradition. We respect the values of trade unions. We respect the values of the Left. But the Left also has to do with creating meanings. There is no solid working class tradition or Marxist tradition because people are no longer there. People don’t feel like that anymore. Some say “yeah, we are working class, we are working class,” as if repeating it ten thousand times in front of the mirror makes it true. But it is not happening, no matter how many times you use the words. We have new metaphors to help build a better, more democratic society. So let’s stick to demands, more than to words. To put it more academically, let’s speak the language of hegemony, rather than the language of ideology. DM: You have emphasized the need to have close connections with “struggles from below,” Podemos’s organisational structure is based on circles: self-organized groups, small local assemblies that regularly meet and discuss. In what way do you see the need for the existence of a party like Podemos? What separates the political action within Podemos from that of the local assemblies? EM: It is true there has to be a connection to struggles from below, but those are different realities. You cannot tell social movements to follow the pace of more formal politics, because if you do you are going to ruin them. It is all about what position you have in civil society. Parties have one position in society, and movements have a different position, no matter how much they share common spaces and common issues. There might be people in Podemos who are also in social movements. There might be people in Podemos with no experience in social movements. At all events, there is a tension between the process of changing a country by building solidarity networks and by standing in elections, winning institutional power, and being more hegemonic, being able to set the agenda. Both of them are very important in politics but you cannot possibly mistake an electoral process for building a solidarity network. We in Podemos are talking about people who have nothing to eat, no school for their children, or credit to launch new businesses. All these things have a different pace. There must be a tension between parties and movements, because if that tension does not exist parties will be less accountable and movements will not be able to see their work institutionally reflected. Let me give you an example: We say very often in meetings and on media that it would be great if someone from the social movement in favor of education could actually help writing the law that was to rule education under a Podemos government. And that, of course, would be great, but it does not mean that the social movements for education reform should become political parties. There is no logical transition from the social to the political. Everything is social and everything is political, in different ways, but no political articulation is derived from a social problem. By this I just mean that with the same social materials you can either get right-wing anti-establishment populism, raw anti-politics, Podemos, or none of them, depending on a huge range of factors. The way movements and parties do politics must remain separate both to help movements develop a different relationship with power as well as to help make parties more accountable. 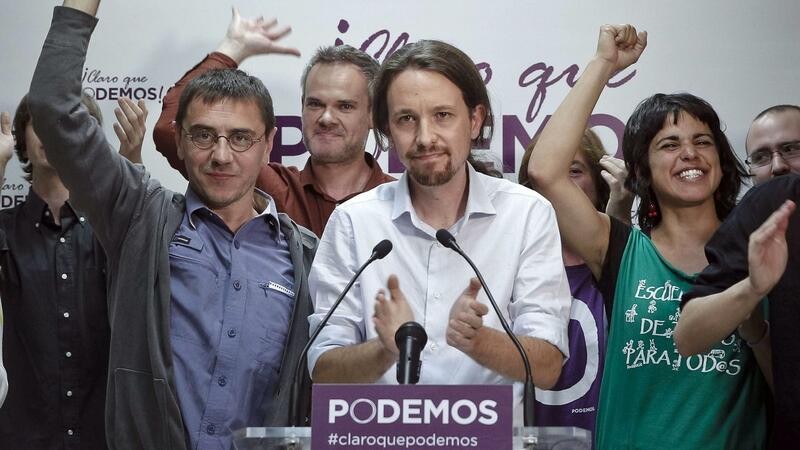 Without the movements, Podemos would be a worse party. But by only rallying mass movements and building solidarity networks, you cannot possibly change the country. You need both, and the state of emergency is so deep and so urgent, the problems and needs not being met are so important, that you cannot possibly do it without both. LP: As I understand it, Podemos came out of the Indignados movement. It emerged at a moment in 2011 when their struggle was happening globally—Occupy, the Arab Spring, and all sorts of other movements and uprisings around the world. Podemos came out of this, but was not formed into a coherent organisation until 2013. Since then, you have gone to electoral success in 2014. At the same time, whilst the networks may remain in Spain, there has been a retreat in those struggles, both in Spain and on a global scale. So, when looking back to your point of origin from the present where you have an international position within the European Union, what kind of challenge does that pose for you in maintaining the dynamic tension you mention? EM: You think there has been a retreat? In Europe? LP: Yes, perhaps it is different in the U.K. than in Spain or elsewhere. Syriza has had some success, for example. But in a great number of European countries (as indeed, Tariq Ali mentioned during the event last night) there has also been an unmistakable move to the right, in France and Denmark, for example. EM: Well, I don’t think we should focus too much on the movements. Activism is necessary and in the last 40 years it has inspired so many struggles, so many victories as well, that it is impossible to diminish its importance. But it’s only the people that can change the country: The People. The activists are important in catalyzing and imagining change, but they are not the subject of change. After all, they are just a small segment of the population. Solidarity networks have built extraordinary things in different neighbourhoods in Athens, Madrid, and Barcelona. But they cannot actually change countries. For that you need a different subject of change, one that is much more diffuse. That subject is the people. And we all know how people are—we live with people, we chat with people, we work with people. They have feelings, they feel anger, they sometimes feel that the system does not work. But the fact that people feel the system does not work does not necessarily lead them to anti-capitalism. So, Podemos tries to build what we call “popular unity.” Popular unity means there is a very basic agreement in society, according to which we should get rid of those that do not represent us, because they represent other people. We must rebuild and reinvent representation, in order to take people into account and to make their demands be heard, and also in order to address those problems as far as we can, as long as we can in order to change the country, in order to change the continent. We desperately need a substantial redistribution of power in order to put some new policies forward. We also need a lot of common sense and a lot of support, because if Podemos or Syriza or any other radical democratic party wins a national election every power in Europe will try hard to tie them down and to make them agree that there is no alternative. To challenge that you don’t need a lot of people on the streets, what you need is popular support (again, this means a different common sense). To address the problems the old solutions claim to address requires this different common sense. Because if not, people will help get rid of the establishment but they won’t support the changes that need to be made. This is not only about revitalizing the establishment; it is about changing the rules of the game. To accomplish this we’ll have to do a lot of things that have nothing to do with winning elections. It is a more subtle process than that. For one thing, it’s about more than going out to rally massive numbers on the streets. Support is also at home. Support has to do with people watching TV and thinking, “That’s right,” not only running down the streets and shouting. DM: Podemos makes a number of appeals to “populism,” but this has problematic history. How do you differentiate your version of populism from conservative populism or from the old Stalinist strategy of the Popular Front? EM: Marina said yesterday, “Syriza is a populist party, because it speaks in the name of the people. When Syriza takes power, it will be the power of the people.” Wherever and whenever there is representation (and of course, institutional politics has to do with representation), this necessarily remains incomplete. You cannot possibly represent everyone, every need and every demand. That is naïve. But I don’t think the aspiration to do this is populist. You could use a different word and the problem would remain the same. What you try to do is to build a new common sense that does not exclude anyone, that actually makes everyone—well perhaps not everyone, but as many people as possible—part of the politics you are trying to advance. This in turn means that the subject to whom you appeal is very diffuse. To address the people means something like this: “No matter whom you have voted for in the past; no matter if you feel conservative or liberal or neither; no matter what you think about, for example, NATO; if you agree on this idea of Democracy, you are a part of it. Because no one in the world, apart from 500,000 activists across the world, is at the same time anti-capitalist, feminist, environmentalist, anti-war, and anti-racist. No one is like that actually! People might be environmentalist, but not necessarily feminist. People might be feminist but not necessarily socialist. Moreover, the people have a plurality of demands, and this plurality cannot be deleted. It cannot be easily resolved. So, politics is about framing things. The way you put things, the way you build your position in a symbolic space. LP: But speaking the language of hegemony and abandoning that of ideology, how does one address the fact that the people are angry at “the banks” or “the immigrants”? So, is it really just a question of framing? EM: Let’s take the example of UKIP here in Britain. It is building upon an actual feeling, a feeling of insecurity. Now, it is also possible to frame things in a way that leads people from insecurity. The issues are there, the social problems are there. Immigration is an issue everywhere. It is an issue in Spain, with many people dying trying to cross to Spain from North Africa. But what we say is, “These people deserve not only rights—the right to live, of course! But also the right to an opportunity: Because Europe should be a space where human rights apply to everyone. So no one is illegal, and we are all immigrants.” That is the way we frame it. If we had a country that actually worked, a better country, a more democratic country—in our view democracy and better management, democracy and a better society are strongly interconnected; so it is not a question of hiring very good managers from the finance world in order to put things right; no, it is about more democracy—if these people lived in a different society and if Europe was better, more democratic space, then immigration would not be a problem. So the issue is: How do we challenge the UKIPs of Europe? By saying to all the people voting for them that they are racists? No, we should not insult them, because those people might be necessary to change this country. Anyway, they are not racist necessarily. I don’t think that British society is racist. It hasn’t been in the last 50 years since the end of World War II, so why assume it is a question of racism? No, it's just that the Left and the democratic forces in the UK have failed to challenge the way UKIP frames social issues like immigration. It is the establishment politics’ fault. UKIP is the monstrous offspring of the crisis of the establishment. So let’s try to build a chain of equivalence between anger and the fight for democracy, instead of the blaming of immigrants. That’s the question of framing. LP: You say that UKIP emerges from the crisis of the establishment. Would you characterize that as a crisis of neoliberalism? Is there anything progressive that can come out of that crisis? EM: Neoliberalism has forced or turned Labour to the right. It is not that Labour has been pushed rightwards by bad people such as Tony Blair. No, it is just that in neoliberalism it is not very clear where and how state policies are defined and developed. For instance, we have the national debt, of European countries not having control or sovereignty over currencies. So, many European countries don’t control the money. It is ruled by the European Bank, so they lose control of the currency. The European Bank cannot lend money to the state, but must lend money to the banks of the state who can then finance the state. So the way things happen under neoliberal conditions has created a very tight form of establishment. This means Labour cannot do anything different and, of course, the right is quite comfortable with this situation. But even the right has had to accept things, like gay marriage. How can we get out of this situation in order to build a more democratic society? Firstly, the fact that many people agree the establishment is rotten might lead to the need for a new political space with other actors, a situation that would allow us not to be forced to choose between one thing and the same thing. We need to create by political means the desire for change, which is genuinely felt at present but diffuse. Where is the alternative? It is not going to be built from above. It has to be from below. How to do this? By opening up processes in which people can actually take part in building an alternative. Podemos is a tool in that process. Podemos is a work in progress, in which what is being built is not a new party of the Left but a new country. This is much more ambitious in terms of framing. It is a new country and a different society, more democratic but also more transparent, more accountable. All the things that people lack in the current system. LP: A lot of thinkers and academics associated with Podemos have taken inspiration from figures like Marx or Spinoza in their writings. How do you relate their ideas to the present? EM: Podemos is a hypothesis. It is possible to build upon the new political space opening in front of us. This is a matter of experiencing society as it is changing in front of you—watching Spanish society change after the Indignados movement, developing new ways of framing politics, of feeling politics, even of hating politics. These are all things that we have experienced. There is now a cooperation and a solidarity that didn’t exist before these movements, which hadn’t existed for years. All this is an inspiration much greater than Marx or Spinoza, though there are people in Podemos with an academic background, like myself. I come from the Critical Theory tradition—from Adorno. Actually my Ph.D. was on Walter Benjamin, so I come from the Critical Theory, Marxist, academic left world. But I have learned a lot from the experience of the last few years, in terms of how social movements and solidarity networks have developed. And my understanding of politics has changed. LP: How has it changed? EM: Five or six years ago I would have said that I was part of “the left-wing tradition.” I might disagree with you on the French Revolution, but I would say I belong to the same tradition. But after the Indignados movement; after watching my country be destroyed by corruption, impunity, unaccountability, and neoliberal one-way solutions; after hearing people say repeatedly “there is no other way out,” “austerity, austerity, austerity,” and all the rest of it; after this crisis and after watching so many people my age leave the country for lack of opportunity and because of social issues that they couldn’t possibly solve; after watching all the best people of my generation leave my country, you really think, “Okay, we need a change. We need it now. There is no other time. This is it.” This is not about putting things more beautifully or reading another book. It is about seeing your society destroyed. When you see society collapse, you understand that all the books you have read are very important but also you need to learn from certain experiences that are new—new to the world, new to your country, new to your generation. Something generational is happening. You really begin to think that change has to come without delay, because, if not, you might be in the midst of a depression that could last for the rest of your life. I have been an activist for a long time, but I have never been as engaged with social movements as I am now with Podemos. Because today I feel the need for change more powerfully than before, in a way that really touches me. This is somehow generational. The way that I and others like me are engaged right now has to do with Podemos. I like the project very much, and I feel part of a work in progress much more than I feel like a member of a party. This has to do with something that cannot be readily translated into the British context. I cannot tell you why. It is something I myself do not understand. This is much more important than many aspects of my personal life. I actually feel it and I am not ashamed, because I understood as well that the political field is not solely constituted by rational actors. I might be an academic, but I am not a completely rational actor in the political field. I also feel all sorts of things that I know are helping me develop this project. That is why I understand, perhaps better than in other countries, the hate and the anger at the establishment. I understand it well and I try to build upon that, rather than tell people that they are anti-political or that they don’t know Marx. Emotions are very important in politics, and I feel those emotions right now. I didn’t feel them five years ago, though I was already an activist then. I was born in the Basque country and I have a background in Basque politics. So, I have been a political actor for a very long time, since I was fifteen, because I was born in a very complicated context. I have been a political subject since the mid-nineties. My first political memories go back to the First Iraq War in 1992. I perfectly remember Desert Storm and all that. But still, it was a combination of different aspects—historical, theoretical, emotional, and, somehow, generational. LP: So, what next for Podemos? EM: We are still in the process of constituting ourselves as a party. We have a general meeting this month, and what we are trying to do is build an organisation that “Dares to Win.” We have arrived on the political arena in Spain. Now we need to build an organisation that looks at society and doesn’t simply navel gaze at the party. We need a party that is really a tool for change, not just internal discussion, like the parties of the sectarian Left—the Trotskyists, the Maoists, etc. Many people in Podemos do not have that background and we are very proud of this. We need a party that dares to win, that is connected to society, that listens to the people, and that sheds the depressing feeling the Left has always had of, “We are going to lose again.” We want to put ourselves in a position to win. We can win the election. We have to win the election. It is an emergency. We have to put all our efforts into that, and not into other things. LP: Is winning primarily a matter of formulating certain demands?